Ida Lee Durant obituary. Carnes Funeral Home. Sep 21, 2017 My sympathies to the family; it is not easy when someone we love dies. The pain and grief can seem unbearable. May it comfort you to know that God promises that the dead will live again. Ida Lee Scott Kirk Durant was born on July 26, 1936 in Oklahoma City, Oklahoma to her father Marion Dinwiddie and her mother Agatha Starks as the oldest of 7 children. She lived 81 incredibly strong years before she went home on September 12, 2017. Ida grew up in Oklahoma City in a loving and God-fearing home raised by Chief Bishop F.C.Scott and Etta Scott. She married Wallace Kirk, SR. (Sarge) and in this union Ida and her family settled in Dickinson, Texas where she was a devoted mother to 6 children, Deborah Kirk/Taylor Sims, Earl “Sam” Kirk/Taylor, Robert “Tootie” Kirk, Wallace “Nookie” Kirk JR, Regina Kirk-Goffney, and Charles Kirk. Her husband Wallace Kirk, SR. proceeded her in death on April 23, 1983. In her later years, Ida remarried Thomas Durant (Mr. Tommy or Papa) and moved to New Orleans, Louisiana where she raised two of her grandchildren Ashley Kirk and Brandon Kirk. Her beloved husband Thomas proceeded her in death on April 11, 2000 to which she relocated back to Texas to be closer to her children during her retirement. Ida later joined Mount Olive Baptist Church as her devotion to her faith only got stronger through her years. 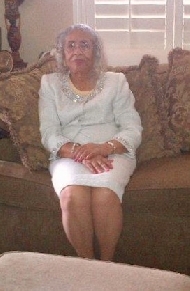 She served in the Sr. Choir; as a member of the Sr. Saints and was a devoted Sunday School attendee. Two of her children proceeded her in death: Charles Kirk as an infant in 1970 and Wallace “Nookie” Kirk, JR on April 19, 2009. Known by many as Mrs. Kirk, Mrs. Ida, and more commonly Mama or Granny, she leaves to cherish her memory: 2 Siblings Marion Jr. and Marva, 4 children, Deborah (Kirk/Taylor) Sims, Earl “Sam” Kirk Taylor (Betty Jo), Robert “Tootie” Kirk, Regina Kirk-Goffney, Son in Law Kirby Goffney, grandchildren, great-grandchildren many nieces, nephews, cousins, great friends, countless neighbors, and her grand-dogs. Her infectious love and acceptance was felt by many and will be forgot by few. There will be a public visitation held on Thursday, September 21, 2017 at 9am with a service starting promptly at 11am. The service will be held at Mt. Olive Missionary Baptist Church 2901 Ave C , Dickinson,Texas 77539.